20th-century green half-morocco over marbled green papers over boards by Marguerite Duprez Lahey. Purchased by J. Pierpont Morgan (1837-1913) in 1905. Made for Philip the Good, duke of Burgundy (1419-1467) or Charles the Bold, duke of Burgundy (1467-1477); their arms on fol. 1 (quarterly, 1 and 4 azure, 3 fleur-de-lis or within a border compony gules and argent; 2 per pale or, three bendlets azure within a border gules, and sable, a lion rampant or; 3 per pale or, three bendlets azure within a border gules, and argent, a lion rampant gules; en surcoat or, a lion rampant sable); Libraire Damascène Morgand, Paris, Inv. no. 28999bis; Edouard Rahir, Paris; purchased by J. Pierpont Morgan (1837-1913) from Rahir in 1905; J.P. Morgan (1867-1943). Ms. epistle lectionary; written and illuminated in Belgium, perhaps Bruges, ca. 1470. Texts: Epistle lectionary (fol. 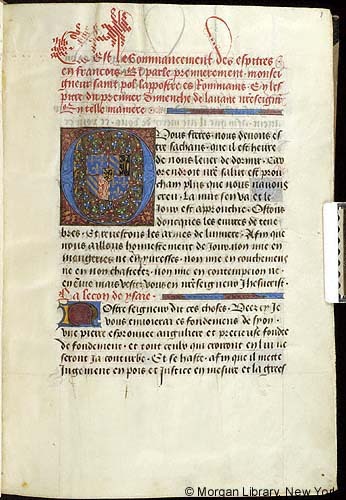 1-153); commentary on the Apocalypse, with anonymous gloss (fol. 157-243). Artist: in the style of Loyset Liédet.